Losing weight is one of the most common New Year’s resolutions. Why do so many people struggle and fail? Here are the top ten reasons. If you want to lose excess weight, do you think your goal should be a particular number on the scale? Think again! If you really want to succeed, for the long term as well as the short, you have to focus on strategies and skills which are supported by research. As one patient said, “If I start wrong, I’ll end wrong.” Very true. To borrow a term from my colleague Dr. David Katz of Yale, success requires “skillpower” more than willpower. Learning what works from an expert who knows the science, practicing the techniques until they become “second nature”, and having support to get back on track when you inevitably slip (no one is perfect) are keys for sustainable, healthy weight. Fad diets, quick fixes, and ads for “magic bullets” for weight loss are a waste our valuable time, energy, and money. Even worse, they steal our self-esteem and momentum. The real danger of fad diets is that since they don’t work, they make people discouraged, and feel like failures. People can end up feeling exhausted and depressed, and give up on healthy lifestyle change. Don’t let fad diets steal your thunder! It makes more sense to invest in our health, learn what actually works, and focus our energy on effective changes, not waste time on snake oil. There is actually fairly robust science which tells us which strategies are likely to yield the best results - and learning what they are can make all the difference in your success. If we try to change too much, too quickly, we can become overwhelmed, and give up. On the other hand, if we make too FEW changes, we will not see any significant results, and we will also give up! For example, have you ever thrown yourself into an extreme diet or exercise regimen, only to find it is too complicated or too unpleasant? Nearly every one of us has done that at some point, and we just stop. On the other hand, have you ever decided you’ll try to lose weight just by parking a little farther out in the parking lot, and walking a tiny bit more? Walking is great, and we should try to sneak in activity whenever we can, but it is unrealistic to expect substantial weight loss from a relatively minor change. When it comes to healthy lifestyle change, we need to find the “sweet spot” - not so little that we see no results and get frustrated, but not so many that we become overwhelmed and give up. Finding the sweet spot can be tough, and it can be hard to decide what to change first. I’m not sure if it’s our Puritan heritage, our rugged American individualism (and I’m certainly a product of both myself), or something else, but too many people feel deep in their hearts that they should be able to win the weight loss battle all by themselves. They feel guilty, even like failures when they need assistance, support, and guidance. Don’t fall for it! No man (or woman) is an island. Get the help you need - you deserve it! Research from the National Weight Control Registry, a database of remarkably successful people who have lost an astonishing amount of weight, and kept it off for long term, reveals that most people who succeed have professional support. We live in a very challenging modern world which makes it difficult to control our weight; experts call it an “obesogenic environment”. In short, we are challenged on all sides - by “addictive food”, stress, sedentary lifestyles, poor quality sleep, nutritional deficiencies and more. We can use all the help we can get to fight back, and thrive through it all. Don’t try to go it alone - and don’t feel bad for needing a support team! Without a plan, we are doomed to fail. But we need more than a vague plan - we need specifics. The devil, and the angel, are in the details. A plan without details, without specifics, is not really a plan at all. For example, if you tell yourself you are going to “eat better”, but do not have a shopping list, a meal plan, and do not have any support or accountability, you are unlikely to succeed. The best plans are realistic, detailed, science-based. The plans should be realistic given your lifestyle, needs, and preferences. Any food plan should meet the “four enoughs” criteria - it should be simple enough, tasty enough, filling enough, and should yield “good enough” results. If your plan is not working, don’t give up on your health - instead, re-evaluate your plan. Perfectionism can be a double-edged sword - it can work for us, or against us. Have you heard the expression “don’t let the perfect be the enemy of the good”? Being conscientious and focused, goal-oriented, and detail-oriented can be helpful - BUT - too much of a good tendency can backfire. A common trap is trying to be perfect, and when we can’t live up to that, giving up entirely (and beating ourselves up.) “All or nothing” thinking often leads so “nothing” in the end! People most susceptible to this are high-performing, successful, go-getter, often “Type A personalities.” They are often successful as parents, in careers, in creative endeavors, in the community and more - and are all the more frustrated because they are “failing” when it comes to achieving a healthy weight and healthy lifestyle. What they really need to do is give themselves a break! No one is perfect, and life gets in the way of the most perfect plans. Rather than deny perfectionist tendencies, or let them get in our way, let’s make them work FOR OUR SUCCESS. Plan ahead to have some wiggle room in your diet, exercise routine, and lifestyle in general. If you need to quantify it, many people use the 80-20 rule - they stay on track at least 80% of the time, but give themselves 20% wiggle room. Remember, no one is perfect, and if you hold yourself to an impossible standard, you will be disappointed. The best goal is to be “good enough” following your new lifestyle to achieve the health and weight goals you’d like. Let “progress, not perfection” become your motto. 7. Quitting when you fall off the wagon. It takes smokers an average of FIVE attempts before successfully quitting - and that involves changing just one habit. Weight loss involves multiple changes, so don’t be too hard on yourself if you have tried, slipped off track, and find you need to try again. Rather than think of past weight loss attempts as failures, treat them as learning experiences, and “partial successes”. Look back at what did work, what you liked, go back to tried and true tactics, and carry those forward into your new plan. It’s also important to look back at what did NOT work, as well. Analyzing challenges is not “making excuses”, it is a necessary step to plan ahead to overcome those challenges in the future. Sometimes there is a single trigger that throws us off track, over and over. Once we know that trigger, we can make plans to circumvent it. And don’t forget: plan ahead to “mess up”. Yes, you read that correctly. People in the National Weight Control Registry who are extraordinarily successful in losing weight, and keeping it off, are not perfect, it turns out. They are, however, very good at forgiving themselves and have a plan in place to get right back on track! Have your support team and “rapid recovery” plan all set BEFORE the inevitable happens. A successful patient once told me, “I finally figured it out, everyone falls off the wagon, then we have a choice - climb back on the wagon, or let it run over us!” She does not let the wagon run over her any more. If we are deprived of any of our basic human needs - sleep, relaxation, recreation, time alone, time with others, spiritual needs, creative needs, the need to connect with something larger than ourselves, the need to feel like we are contributing to the world - it is easy to turn to food to fill the gap. If you find you are eating out of control, stop and ask yourself if there is another “need” that is going unmet. It’s easy to make the mistake of EATING to try to fill those needs - but remember “If the inner baby is crying, maybe he or she isn’t hungry for food.” Figuring out what we REALLY need can take a little time and reflection, and sometimes talking to someone can help. Life is too short to miss out on fun - and the good news is that allowing yourself a little indulgence - even “being a little bad” can have very good weight results in the end. Let yourself feel like you’ve treated yourself a bit, or even that you have “gotten away with something”. This strategy is actually based on research which shows that people can only stand feeling deprived for so long… then they ‘act up’ in some way. If they are on a very tight financial budget, they tend to overindulge in unhealthy foods. And if they “treat themselves” in a non-food way (indulging in some retail therapy, sneaking away to a bookstore or cafe, stealing some me-time with a favorite hobby, a quick spa treatment, or a warm bath) they may find it easier to control their eating, and stay on track with healthy food patterns. I have attended more medical weight management courses, conferences, and symposiums than I can count over the past 20 years, from Harvard, to the Obesity Society, the Obesity Medical Association, and more (and have contributed my fair share of lectures). One of the favorite topics which is revised, again and again, is the challenge of hidden medical causes of weight gain. There are numerous causes, including undiagnosed or suboptimally managed medical conditions (everything from vitamin D deficiency, to hypothyroidism, sleep apnea, prediabetes, metabolic syndrome, Cushing’s Syndrome, and more), prescription medications (for depression, high blood pressure, chronic pain, and more), even over-the-counter medications. A favorite “trick question” for physicians new to the field is to ask them to review a medical history for a hidden cause of weight gain...and the answer is Tylenol PM for sleep, since it contains diphenhydramine (also known as Benadryl). Strangely, even though these causes are easily spotted by experts who are board-certified in Obesity Medicine, they are often overlooked by physicians who are not trained in medical weight management. How can that be? Don’t be angry at your other physicians, if they have not spotted a contributing factor. The reality is that very little attention is given to medical causes or treatment of obesity in most medical schools, or even in residencies (including primary care residencies). In order to learn to become an expert in the field, physicians must pursue advanced training, either through course programs offered by several medical organizations, or through a fellowship in Obesity Medicine. Once the coursework is completed and certified, physicians may submit an application to take a comprehensive exam. Once approved they may sit for the exam, and if they pass, they receive board certification by the American Board of Obesity Medicine. When I originally received my board certification, there were two additional steps: an oral examination before the board, and a site visit by a board member, which included a full view of practices and procedures, as well as a chart review (we were required to be in practice for a full year before we would could apply for certification). Certification has become more streamlined and focused, and multiple physician organizations have come together with the new process. Many physicians are only now learning about the subspecialty of Obesity Medicine, and are just beginning to realize that Obesity can be a complex medical challenge - but one that may be treated successfully, using a variety of methods and tools now available. 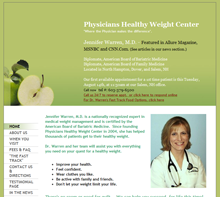 If you would like a full evaluation to search for hidden medical road blocks to weight loss, and a plan to address them, you may want to meet with an Obesity Medicine specialist. So there you have it, the top ten reasons weight loss resolutions fail, and some strategies which can create success.